The Appcelerator Platform is Coming to You! Since launching the Appcelerator Platform, we’ve seen some of the biggest brands on the planet use it to kick their mobile strategies into high gear. But we all know mobile innovation is happening everywhere — independent devs, new mobile ISVs and mobile agencies, non-profits, small- and medium-sized businesses, you name it. This got us thinking: Wouldn’t it be great if we could take all the firepower of the Appcelerator Platform, this engine that’s helping to mobilize the largest companies in the world, and put it in the hands of anyone? I’m very happy to announce that we’re just weeks away from launching an on-demand model that will open the Appcelerator Platform to virtually everyone. And because you’re an existing member of the Titanium community, you’ll receive an Indie seat to the Platform — which will be priced at $39/month — entirely for free. 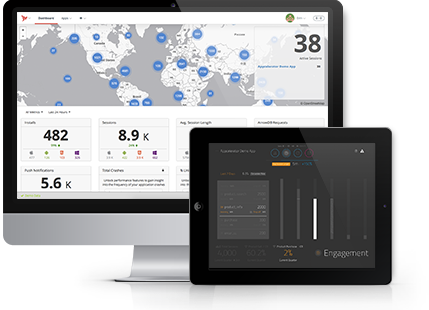 Real-time mobile analytics: for a rich, unified, real-time view of the key usage metrics for every app you’ve built. To be clear: Titanium will remain the same great, open source app development SDK it’s always been, available for free under the Apache Public License on GitHub for anyone to use. For those who need more — more capabilities, certified releases, flexible deployment options, dedicated support — there’s the Appcelerator Platform. Beginning this Thursday, April 2nd, we’re going to start opening on-demand access to the Platform via invitation-only. You’ll be able to sign up directly from our new website. Invitees will get early access to the entire Platform, and help to assess ease-of-use of the new onboarding experience. You can also sign up by clicking the button below. I’ll be hosting a webcast this Thursday to showcase some of the killer new features that will be a part of this latest Platform release. (Remember the name “Arrow”…) You can register to join below. *Update: Did you miss the live event? No problem, you can watch the entire webcast here. We’re on the cusp of bringing even better, more powerful capabilities to mobile innovators far and wide. But as a member of our Titanium community, you were here first. The Appcelerator Platform will soon be yours, for free, forever. You’ve earned it. All of this comes with my thanks, and the heartfelt thanks of the entire team here at Appcelerator. We couldn’t have done this without you. Who qualifies for the offer of a free Indie seat on the Platform? Anyone who downloaded Titanium on or before March 31, 2015. How do I claim my free Indie seat? Once your activation link arrives, you’ll have full access to the Platform in its “developer trial” mode, which lets new users take advantage of most of the Platform’s capabilities before making a purchase decision. You’ll notice that when you go to the Platform’s billing page, the Indie plan will be marked “Free” — only for Titanium community members, of course! Is the offer to a free Indie seat open only for a certain time? Yes. While the free Indie seat license is good forever, those interested must sign up to claim their seat by June 30, 2015. Don’t worry — we’ll remind you! What does this mean for Titanium? The open source project will continue in GitHub as it always has. The Titanium SDK will continue to be available here and licensed under the Apache Public License. The open source project will continue to provide the Titanium CLI for working with the open source Titanium SDK. Going forward, certified releases of the SDK and Studio will be available only to Appcelerator Platform users — which of course will include anyone who was a member of our Titanium community as of March 31, 2015. If you want to use the open source Titanium SDK, you will need to build your own version of the SDK from GitHub. Can I continue using the open source version of Titanium with my existing apps? What happens to Titanium Studio, ACS, Node.ACS and analytics? On June 30th, 2015, Titanium Studio will be discontinued in favor of Appcelerator Studio, which offers more advanced capabilities. For our Titanium community, this means more for free. The current ACS website (cloud.appcelerator.com) will be discontinued in favor of the Platform’s integrated dashboard, as will the current analytics site (my.appcelerator.com). You will need to migrate to the new dashboard site prior to September 1, 2015. How do I move my existing app(s) onto the Platform? Just import your Titanium app(s) into Appcelerator Studio and click Enable Platform Services. This will make the power of the Platform available to your app. For migrating Node.ACS applications to the Platform’s new capability, Arrow, see here. I’m happy with Titanium. Why would I move to the Appcelerator Platform? Put simply, because you’ll get more for the same price — that is, free! Richer analytics capabilities including an integrated dashboard, 2x the cloud API usage allotments, ongoing certified releases, as well as all the advanced capabilities of Appcelerator Studio. What will people not already in the Titanium community pay for the Appcelerator Platform? Prices will start at $39/month for the Indie plan. We will also offer Team and Enterprise plans with additional capabilities and options for premium support.